Julie - Fashion Shopify Theme is a feature-rich and catchy eCommerce website theme. 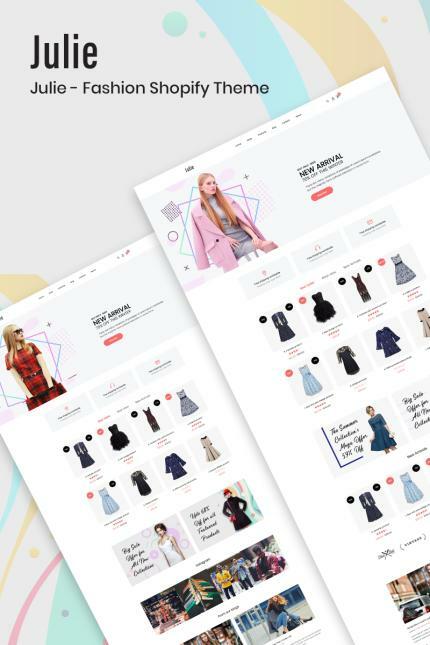 It is intensively designed for eCommerce Shopify website that sells Men Fashion, Women Fashion, Kids Products, Cosmetics, Ornaments, Travel Accessories, Sunglasses, Leather Goods, RMG Products and almost all other vendor products. Julie, quick-install, theme provides bundles of dominant features like- 100% Responsiveness, Cross-Browser Compatibility, Theme Colors, Box Style, Newsletter Popup, Notification Bar, Ajax Popup Cart, Ajax Wishlist, Quick view, Newsletter, Multiple Currency etc. Moreover, this theme has Shopify Builder, Theme Colors, Box Style, Header Style, Dropdown Menu, Ajax Popup Cart, Megamenu and many more. Julie ensures excellent product displays that brings catchy look. It brings Product Review, Product Video, Related Product and Custom Tab as well. In addition, Julie is flexible in communication too as it has Contact Form, Contact Information, Contact Map, Blog Page, Blog Detailed Page and more. Visitors have the options to make Product Share, Social Media Share, Comment etc. Furthermore, you will get 15+ Preloader and detailed Documentation in Julie Shopify Theme. Install it soon through a few clicks.